Your water pressure tank is an integral part of your water system. A faulty tank can cause adverse pressure fluctuation and lead to premature pump failure. Just because your tank is not leaking it does not mean that it’s in proper working order. A burst bladder in the tank can cause the tank to lose its air charge causing the tank to become water logged and making the well pump cycle more than it should. 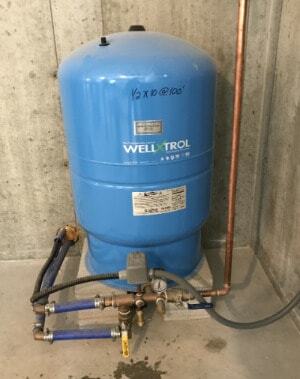 A faulty water tank is one of the leading causes of premature well pump failure. We recommend every few years to perform a tank tune up service where we check the air pressure in the tank and recharge it if necessary and also replace the pressure switch and gauge so your water system works at peak performance. The water storage tank is the heart of the water system and often over looked. Most people pay no attention to the tank until they see a leak. It is very important to check the air pressure in the tank once a year. The tank is there to be a buffer for the well pump to push excess water into while the pump is running and also to allow the pump to have a run cycle of a recommended 60 seconds or more. If the tank loses its internal air pressures the internal bladder may over expand and burst, trapping the water in the tank. Over time the tank will become water logged and cause the pump to cycle on and off more frequently. Time and time again customers tell us they heard lots of clicking noises from the tank when the water was used but paid no attention to it. That sound is the pumps pressure switch turning the well pump on and off rapidly. This short cycling of the well pump over time will cause permanent damage to the pump and eventually lead to premature pump failure. To learn more about water tanks for wells, call us at 207-324-1645.